ORU Aerobic Center Gets New Cardio Equipment! On July 17th, the ORU Aerobics Center received 32 new pieces of Matrix cardio equipment. 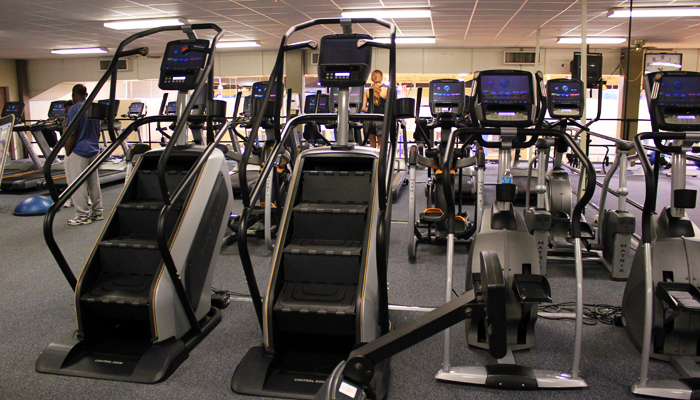 Among the classic treadmills, bikes and stair steppers, users will see the new Ascent Trainers and Climbmills. With the Ascent Trainers, users can perform the classic elliptical motion or make their workout more dynamic, engaging glutes, hamstrings and core stabilizer muscles by adjusting the incline and variable stride length. The Climbmill features rotating stairs with a full 10″ deep step to accommodate a wide range of users. With the step positioning software, the steps will lock at the lowest possible point for users to easily step on and off. Every cardio piece includes Virtual Active, an interactive video program that allow users to escape to the forests of Hawaii, hike through the Italian Alps, or the infamous Las Vegas strip, all within the integrated 15″ touch screen display. The equipment is also compatible with iPod for video and audio playback, charging and on-screen playlist selection and is compatible with Nike + iPod for workout tracking. Other features include an integrated 3-speed personal fan, 14 language display choices and 11 workout programs.